I have three words about the new house. Worth. The. Wait. I've been unpacking since we spent our first night here this past Sunday night. This is our third massively renovated/rebuilt home and it's a culmination of all the things we learned and loved about the last two houses. I love the location - Our new home is about as urban as we could get unless we moved into a high-rise a mile away in dowtown. Just what I wanted! I've been working primarily on the kitchen and the sewing room. We've been slowing retrieving our things from storage and still have a few things to do on the house before I can get completely comfortable. I worked on the sewing room until about 3:00 a.m. night before last and made some pretty good progress. The photo above is Wednesday night. Here it was last night. I still have a long way to go, but I love unpacking and organizing! I can't wait to give you a little tour once things are more presentable. I hate that I've been away so long (there are 4,800+ unread posts in my blog reader and I'm dreadfully behind on emails), but I'm so happy right now I could just scream. Maybe I will. While I unpack. I wish I was to the point you are. 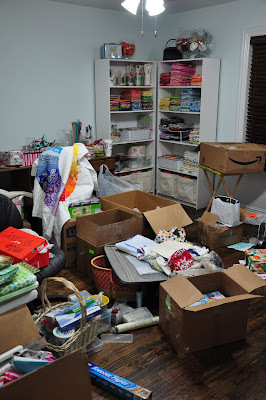 I'm just packing up my sewing room! Starting with the kitchen and the sewing room - yep, that sounds about right. Will you read all 4800+ posts? oMG! Yay, well done! It looks lovely, I'm so looking forward to seeing more details of your lovely sounding new home. You made amazing progress in such a short period of time! Congrats on the newly reno'd home. Love the wood floors! Congratulations on moving into your "new" house! How exciting. It must be such a relief to get your stuff out of storage and unpacked. I love your order of unpacking - kitchen was always my priority and then the sewing room is quite important too. How great it must be to be in the house! What is the color of your sewing room walls? Next week I'm getting wood floor installed and am rethinking the color my the walls. Yours look subtle and soothing. Congrats on the new house and sewing room! I can't wait for a proper sewing room...need a daughter to finish college first though. Then I will have a room and money for fabric - WOOT!!! Congrats on your lovely room! All that hard work, you must be proud and so happy! I love what I am seeing in your room! yes, I want a tour as well! It is all our 'stuff' plus the little knick-knacks that make it a home! Know what I mean?? Congratulations on the move in! Let the fun begin - unpacking and organizing is like Christmas! Your sewing room looks fabulous, really organised already! So pleased you are happy in your new home. We moved 2 months ago and I feel exactly the same! Oh how I would love to live in town again! The 'burbs are okay, but there's just something about the vibe of living in the middle of a big city. ok, need is a strong word, but I totally want one... just like yours! You've worked hard! Congrats on a new URBAN home. I live about 3 major blocks from the high-rises of ATX. I love living either urban or country... not a suburbia lover. 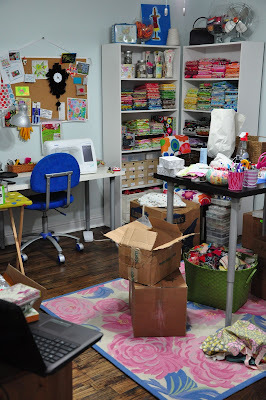 I can't imagine any better room to set up first than a sewing room! Looks like a bright, comfy place to play :) Congrats on the long journey being over and being able to make the new house HOME. where did you get your island? I love it!